This is something absolutely scrumptious–only not edible! 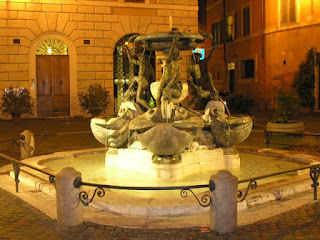 It is my favorite Bernini fountain in all of Rome, in all of Italy, in all the world. La Fontana della Tartarughe…Fountain of the Turtles. When I was in Rome this past April, I had the most delicious surprise–they had cleaned and restored the fountain to pristine perfectness! arms and hands upheld, upturned.